Introduction: In recent years, the Government of Uganda has stepped up its efforts to address malnutrition shifting from a voluntary project-based model for food fortification to a public-private partnership mandatory program in July of last year. This was mandated by the 2011 Food and Drugs (Food Fortification) Amendment Regulations approved by the Ministry of Health (MOH). To support the implementation of this program, the government recognized the need for a centralized system that tracks this information and provides regular feedback to the various stakeholders. Methodology: A meeting was convened in October 2013 with stakeholders from key government groups, including the Uganda National Bureau of Standards (UNBS), MOH, the Uganda Bureau of Statistics (UBOS), the National Drug Authority, and the Private Sector Foundation, as well as representatives from industries, donors, and implementing partners, together comprising the M&E technical working group (TWG) on food fortification. Participants were asked to agree on a standard list of fortification indicators relevant at sector, national, and international/regional level and to identify how food fortification indicators can be streamlined into existing health management information systems, censuses, and surveys. SPRING facilitated small group prioritization exercises for each of the key indicator groups to streamline the indicator list and large group discussions to rationalize the list from the indicator groups into a final draft framework. 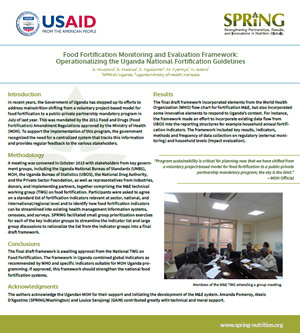 Results: The final draft framework incorporated elements from the World Health Organization (WHO) flow chart for fortification M&E, but also incorporated some innovative elements to respond to Uganda’s context. For instance, the framework made an effort to incorporate existing data flow from UBOS into the reporting structures for example household annual fortification indicators. The framework included key results, indicators, methods and frequency of data collection on regulatory (external monitoring) and household levels (impact evaluation). Conclusions: The final draft framework is awaiting approval from the National TWG on Food Fortification. The framework in Uganda combined global indicators as recommended by WHO and specific indicators suitable for MOH Uganda programming. If approved, this framework should strengthen the national food fortification systems.